A long time garden stalwart Argyranthemum frutescens (syn Chrysanthemum frutescens) provide us with long lasting colourful flowers. Commonly called the ‘Marguerite Daisies’, ‘Daisy Bush’ and sometimes the Federation Daisy, this is an evergreen shrub with a natural dense habit. What is the difference between Federation Daisies and Marguerite daisies? – Federation Daisies are simply Australian-bred Marguerite daisies. Flowering time will vary according to the climate. In warmer areas they flower from autumn through to spring. In cooler climates they will flower right through summer. Traditionally these were the white flowering daisy, today we have huge variety. The colour pallet is ever increasing with hybridisation, pinks, whites, yellows and reds, they also come in double flowering forms. These are originally from from the Canary Islands and Madeira and are the old fashioned daisy plants that gardeners love. 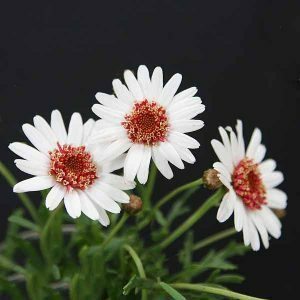 Depending on variety, climate and soil, Argyranthemum frutescens will reach around 50 cm to 1 metre in height, with a similar spread. Growth rate is fast and they are well suited growing in the middle of the garden border where they add a little height. They are also suited to growing in containers in courtyards or on a balcony. A. Peppermint – Single white flowers flecked with pink. A. Tracey – Double pink flowers on a compact bush. These are not fussy plant although they do prefer a well drained soil and a sunny position. Easy to maintain by simply pruning back in late summer, this will keep the plant bushy and healthy. 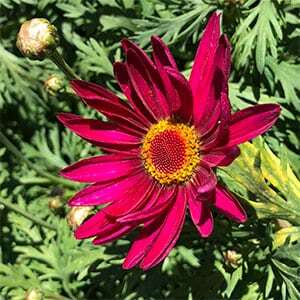 You can also deadhead through the flowering season to promote more flowers. How much can you prune back? – Usually around 50 %. The best time to prune is in early spring.